If your refrigerator does not have an integrated water filter, that doesn't need to stop you from enjoying the benefits of filtered water. The Water Sentinel WSI-1 is designed to be installed directly in the water line feeding into your fridge. It works on both copper and plastic water lines, and it's as easy as shutting off the water, cutting the line, and inserting each line into the ends of the WSL-1. Great tasting ice and drinking water can be yours in under 30 minutes. The Water Sentinel Refrigerator Water Filter (WHKF-IMCF comparable) uses Activated Carbon Block to remove contaminants for up to 6 months. 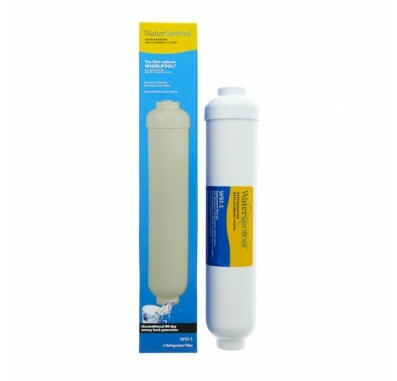 Special catalyzed granular activated carbon reduces chlorine and chloramines to give you great tasting safe water. Quick connect fittings make installation a breeze. With a 6 month filter life, it only needs replacing twice per year.